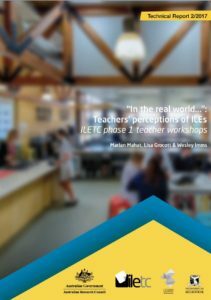 Today we release our second report “In the real world…” Teachers’ perceptions of ILEs – ILETC Phase 1 teacher workshops and fact sheets. The report outlines our findings from a series of workshops conducted with teachers and principals late last year and early this year in Australia and New Zealand. These workshops were part of our data collection processes that tested the basic assumptions for our research by seeking input from teachers on how they viewed innovative learning spaces and student learning. How we should define an ILE? Teachers define innovative learning environments as one with adaptable spaces and ubiquitous resources and technologies, which can evolve and change to suit different types of student centred learning. Teachers felt their practices were supported by flexibility in use of space and ability to use different teaching approaches. When teachers move into new spaces they are often concerned with how the spaces will impact on students and the configuration and use of furniture. Teachers identified a range of support mechanisms necessary to support their transition to new spaces. Teachers believe success in student learning is often constrained by the physical space. What does deep learning look like? Teachers perceive Deep Learning as creativity, critical thinking, character, collaboration, citizenship and teachers as learners. Read the full report and access quick reference fact sheets here.